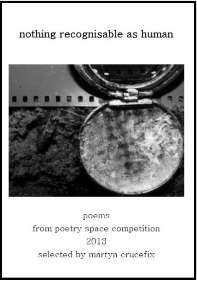 The top twenty poems from Poetry Space Competition 2013 chosen by Martyn Crucefix. Poems by Dorothy Baird, Ama Bolton, Pat Borthwick, David Clarke, Rachael Clyne, Margaret Eddershaw,Wendy French, Eileen Carney Hulme, David C. Johnson, Susan Latimer, Kaye Lee, Afric McGlinchey, Gwen Seabourne,Robin Muers, Anthony Watts and Janice Windle. the contents of this dusty envelope. the cursor has him in its sights and…Zoom! ISBN: 978-1-909404-10-6 £5 Stapled 32 page booklet.